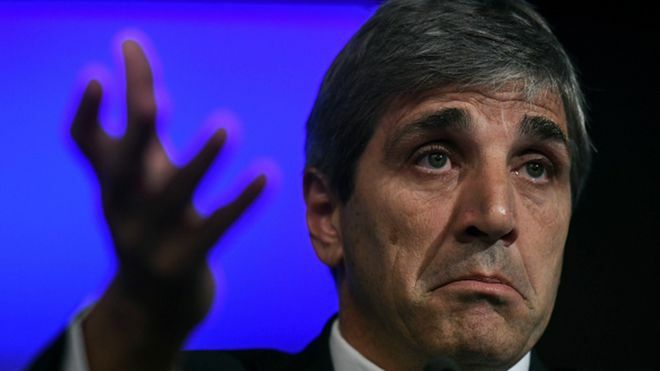 The head of Argentina's central bank has resigned amid reports of a row over policies to restore confidence in the country's ailing economy. Luis Caputo had only held the post since June, and the surprise resignation sent the peso falling further against the US dollar. A statement said he quit for personal reasons and will be replaced by deputy economics minister Guido Sandleris. Argentina is finalising a $50bn bailout from the International Monetary Fund. With Argentina in recession, interest rates at 60%, and the peso's value halving this year, the country needs the IMF loan to bolster confidence in the economy. President Mauricio Macri is in New York this week for a United Nations meeting, but was due to meet Wall Street financiers and potential investors.